The flexible flue systems from 80mm to 160mm are available for use with our gas and oil condensing boilers. Available in a selection of lengths from 10 meters to 50 meters. Transition sections from rigid to flex complete with integral riser support. Centralising brackets to ensure correct routing within the existing shaft. A choice of terminals for conventional or balanced flue opertaion. Removes the requirement for access hatches due to one piece construction. 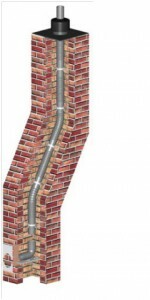 Works in harmony with our range of rigid concentric and PPS flue systems.